There are 7 other boats in the ferry schedule schedule that go Phuket to Phi Phi Island in the morning. 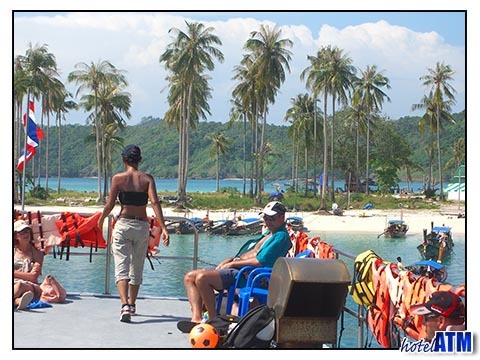 Apart from Sea Breeze 2 (to the Cabana Hotel), they all involve organized tours taking in Phi Phi Ley on the way to the island. This means that the Paradise 2000 is the fastest boat in the morning to get to the main pier at Tonsai Village. (The Sea Tran ferry can get to Phi Phi Island earlier as it is a faster ferry but it anchor's off in the bay and the transfer to the beach (at Tonsai Village Bungalows) is slower.However in the low season when the waves can be bigger, this is the ferry service to take as this ferry is the best designed in the larger waves. Due to the time, the Paradise 2000 is the favored boat of the local population and those not doing a one day tour. The other advantage is that there are rarely tour groups on board which makes seating more easy. Departs: Phuket Town, Rasada Pier 08.30. Often the most on time boat.